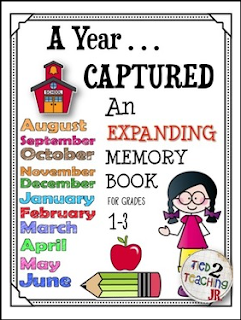 Back to School Memory Book (Grades 1-3) is an expanding memory book that grows as your school year progresses! Included are one Memory Book sheet for each month of the school year (August - June). Each page has a place for students to draw pictures, cut and paste work, or write quotes that represent what happened in class that month. In addition, each page also includes a section for them to write a few sentences about their memories for that month! At the end of the year put all the sheets together for A Year . . . Captured keepsake the kids can take home! Wishing you the very best year!